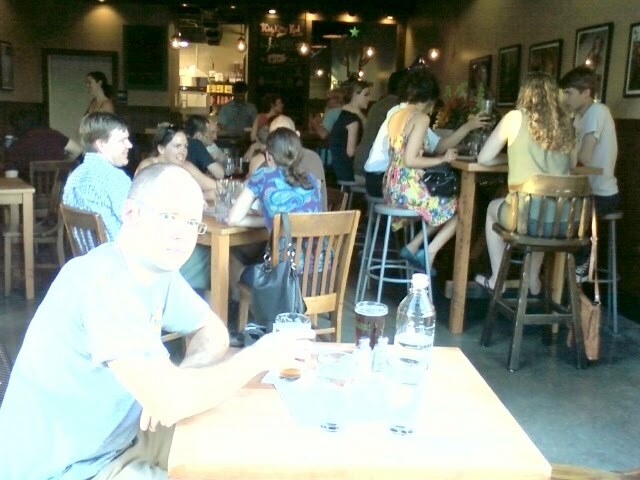 While I was in Texas, Coalition Brewing opened at SE 28th and Ankeny where Noble Rot used to be a few years ago. Coalition is only about a year late: in April 2009 when word of the new brewery got out, they expected to open that summer under the name Hobo Brewing. Think of the pubs that have been built out and opened during that time: Migration, Apex, and Breakside come to mind. A few of us went by late last week to check Coalition out (sorry about the picture, Dave). The beers fit into standard Northwest pub styles -- a pale ale, a stout, a red ale, and a hoppy bitter -- which suits me fine, those are all good to drink. The stout was my favorite: dark and creamy, nice roasty flavor with a thick tan head. Dave liked the bitter, though for my money I would have liked to see it with a little less hops, more English style, especially since the northwest red had the hops covered really well. Everything we tried was solidly well done -- no misfires. I didn't write down any of the clever beer names, but they were all of a pretty reasonable strength, between 5% and 6% if I remember correctly. Why don't people opening new pubs start right out with honest pints? I mean, they don't have to be 20-ounce pints, just something with a line marking the volume. It's the wave of the future, best get on it right away. The space is pleasant but pretty tiny: inside there are seats for about 30 people, including 3 or 4 at the bar, and there are 4 or 5 tables outside on the sidewalk. The brewing operation is actually in a building across Ankeny. I believe the original plan was to brew in the same building as the pub, which would have been madness if the kitchen area is on the same scale as the front. Someone is living in the apartment above the pub -- maybe at some point Coalition will be able to expand into that space. It's a great bicycle destination -- there's a bike-parking corral a few steps away on 28th. The panini-style sandwiches were decent, but nothing to rave about. None of us were brave enough to try the mini-meatloaf muffins. Our visit ended in something of a rush: it was last week during Portland's bizarre mosquito infestation, and when the breeze died down right after sundown, we went howling away slapping our foreheads, ears, and ankles. But the beer is the main thing, and Coalition does it right. I'm glad to welcome them to the neighborhood! "they don't have to be 20-ounce pints"
disconnect...so you are saying they don't have to be a "20-ounce 16-ounce"? How can you be taken seriously talking about "honest pints" and then write something like "20-ounce pints". Next thing you will want a "23.5 oz. cup" of beer or a "gallon and a half, quart bottle". And don't give me any imperial nonsense either. A pint is 16-oz. Brian: I didn't express it very well, but I was reacting to Jeff's Honest Pint Project, which says that as long as there are 16 or more ounces of beer, it's OK, and he kind of implies that the solution is to use imperial pint glasses. All I mean is, if the glass has a 16-ounce line, I'm happy. I hope you've had your coffee now and that you're in a better place. I'm not Brian and I didn't mean for the tone of my comment to be negative. Thanks for responding...I enjoy your blog. Oops, I got the wrong guy, sorry about that. Thanks for commenting! Aiieee, I've been bad about reading blogs, thanks to the Astoria trip. Bill is correct: the deal is just a 16-ounce pour. If you want to see the genesis and thinking process, just click around my blog. As to Coalition, that's funny you say the food wasn't good--I thought it was a real strength. I've only eaten there once, but I had a Oregonzola and ham (if memory serves) sandwich that was amazing. I see on their FB page that they've added homemade ice cream--I think as a synergistic way of welcoming their new cream ale. I have to go check all that out.